Where do I even begin? 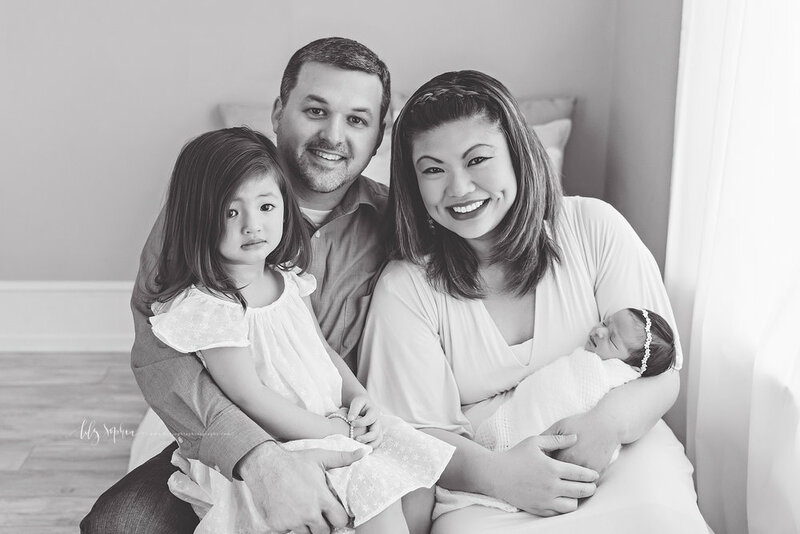 Steve and Irene have been coming to me since their first maternity session at the field location with their oldest daughter, Oona who is now three. Over the years, I have photographed them so many times for milestones, family sessions, and Santa. When Irene let me know she was expecting her second daughter, I was beyond thrilled for them! They chose the mountain location for their family maternity session, and you can view those gorgeous images by clicking here. When Mina was born, Irene let me know she had arrived and we picked a date for the family to come in for her newborn session. Irene and her mother in law arrived first with Mina. I loved how she had chosen to do her hair and makeup! She had already chosen her dress for the newborn session back when we had our maternity fitting, which is very common for clients to do! She asked to see some of our options for little girls and we pulled a dress for big sister Oona to wear when she arrived, which was shortly afterwards. I started with just Mina for her solo portraits in the newborn shooting room and she was wide awake for a little while, but so calm and content. A lot of clients ask if I can photograph their newborn looking at the camera, and I wish I could promise that but it’s entirely dependent on your baby. There are some babies who come in and they never open their eyes the entire time. Other babies are awake but they’re not happy or calm while awake. Every baby is unique, and their session gallery will also be one of a kind as well. Because Steve could only be there for a little while before heading back in to work, we started with family and parent images and wrapped those up so he could be on his way back to work. Lots of dads plan to come to the session over their lunch break and plan for a longer than usual lunch break rather than taking the day off. Weekend newborn sessions are sometimes available, but cannot be guaranteed. After Steve had left, I finished up with Mina. The family portion had worn her out and gotten her tired, and after a diaper change, a bottle, and some snuggling, she was conked out. When babies are deep sleep, I’m able to do a lot more with them in terms of how they look while wrapped. Generally, the sleepier a baby is, the more pliable and flexible their body is. I never force babies into positions and actually love to arrange the wrap around the position they naturally assume when curled up. I want parents to be able to look back on their images and remember every little tiny about their baby. I wish I could say I remember exactly what my son’s toes looks like, but the memory is fuzzy. Having a photograph of his little feet is absolutely priceless and ensures I’ll always remember. As a closing note, every portrait client receives their final gallery images in both black and white and color versions with the exception of our Santa images. I adore the black and white images from this session so much that I’m choosing to share all black and white images for this session!